I have no words for this. Well, maybe one. RIDICULOUS. That’s exactly what these bars are. There is no way I could come even close to describing to you what these taste like. All I can say is that you’ll feel overwhelmingly happy. So much so that you won’t know what to do with yourself. It starts out with a huge smile, which quickly turns into uncontrollable giggles, followed by laughter and the slapping of anything and everyone you can find. You’ll be so enamored you might even start rolling on the kitchen floor… yep, you’ll be a complete loony. But hey, at least you have something to blame. Caramel Nougat Chocolate Bars are prepared to change your taste buds. Are you ready to give it a whirl? Before I started writing this little blog of mine, I was and still am the biggest fan of other peoples’ food blogs. For years I dreamed about starting my own as I kept drooling over the delicious food they were putting out there. One of the recipes that deserves huge credit for the creation of Deliciously Yum! is this one. This post is meant as an homage to all the bloggers that inspired me and who I look up to so much. I have mentioned before that Snickers is one of my favorite candy bars to date. It seems to have it all. 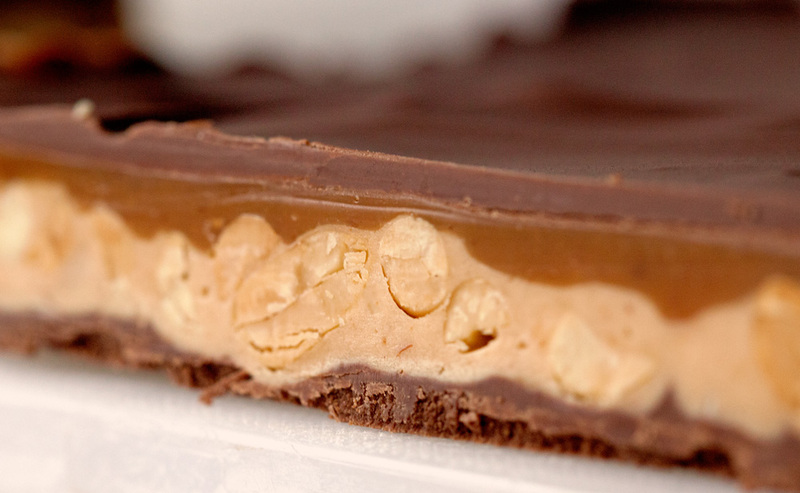 Chocolate, peanut butter, salty peanuts, caramel and nougat! There’s so much to love. With it’s infamous taste, it’s hard to think that one could achieve the same iconic flavor at home. And yet, it’s true. You can. There’s no telling the difference between these babies and the original. None. Whatsoever. I stood amazed as I came to the realization that the secret candy code had been cracked. Right after realizing that I was in big trouble! Do I even need to mention the layers? Fabulous, gorgeous, and definitely drool-inducing! Okay, I’ll stop now. Again, I have no words. One last thing – calories don’t count during holiday season. But you already knew that, didn’t you? I am still impressed with how well we get along. It boggles my mind. 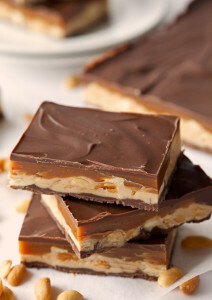 Irresistible Caramel Nougat Chocolate Bars a.k.a. Snickers! These bars a ridiculously amazing. Thoroughly grease your aluminum baking pan. 1. For the first layer, melt 1 1/4 cups milk chocolate chips and 1/4 cup peanut butter and mix until thoroughly combined. Pour into the bottom of the aluminum pan and spread in an even layer. Let cool completely in the fridge for 30 minutes or until firm. 2. For the nougat layer, melt 1/4 cup unsalted butter and add 1 cup sugar plus 1/4 cup evaporated milk. Bring the mixture to a boil and continue to cook (over medium-high heat) while stirring until sugar is completely dissolved, about 5 minutes. Next, add 1 1/2 cups marshmallow fluff, 1/4 cup peanut butter, and vanilla. Stir until creamy and thoroughly combined. 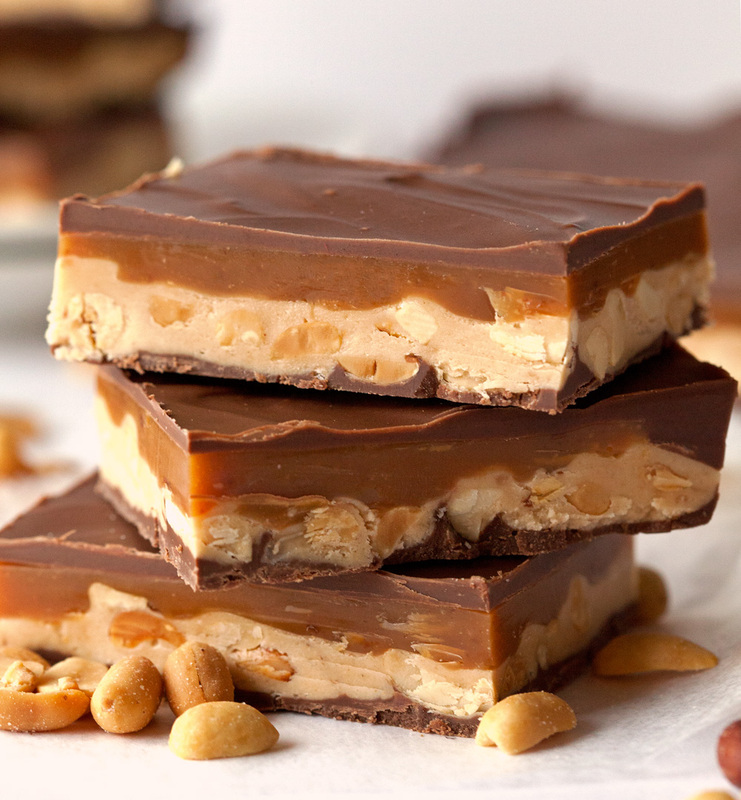 Mix in 1 1/2 cups salted peanuts and spread evenly over chocolate layer. Let cool completely on the counter or in the fridge until firm. 3. For the caramel layer, combine caramels and 1/4 cup heavy cream in a pot. Melt caramel mixture over medium-high heat, stirring constantly! Spread over nougat layer and let cool once again. 4. For the fourth and final chocolate layer, melt the remaining 1 1/4 cups milk chocolate chips and 1/4 cup peanut butter and mix until thoroughly combined and creamy. 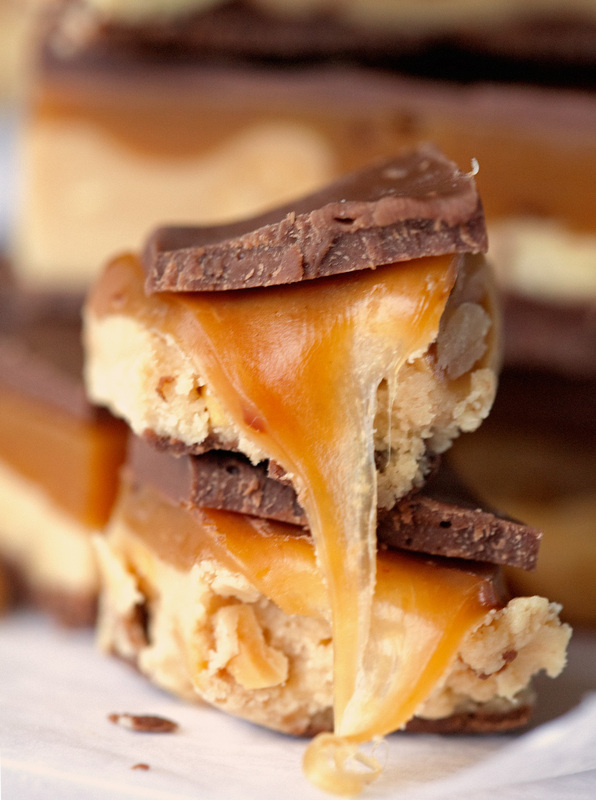 Spread evenly over the caramel layer and let cool completely. Refrigerate for two hours or until ready to serve. 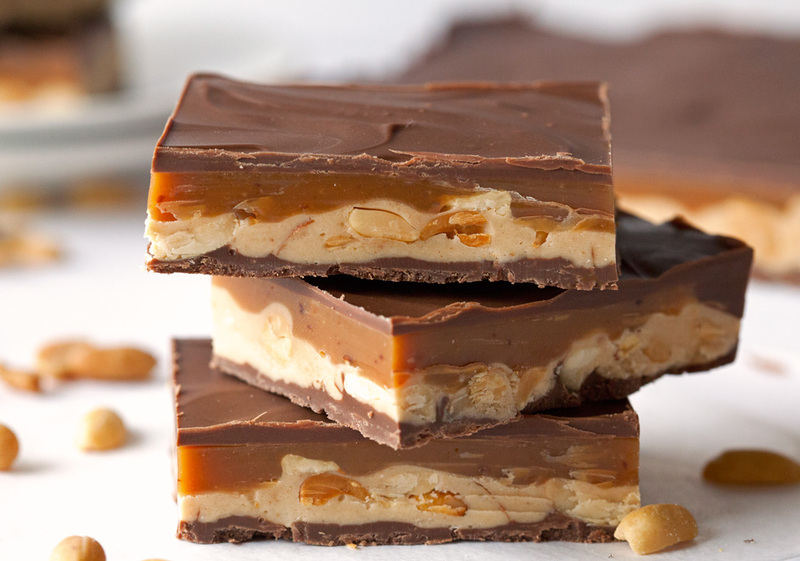 Caramel Nougat Chocolate Bars will keep in the fridge for 1 week. Cut the corners of the aluminum pan with scissors and flatten the sides of the aluminum pan. This makes cutting and removing the bars from the pan much easier. this looks better than a snickers bar! Thanks, Dina! The best thing is that you can cut yourself a piece however small or big you like it, ha! No words … looks absolutely delish! They taste even better! Thank you so much, Karen! WOW!! !I think I gained 3kg just reading this and drooling. Must make it and am so glad that the calories don’t count on holidays! They sure don’t!! 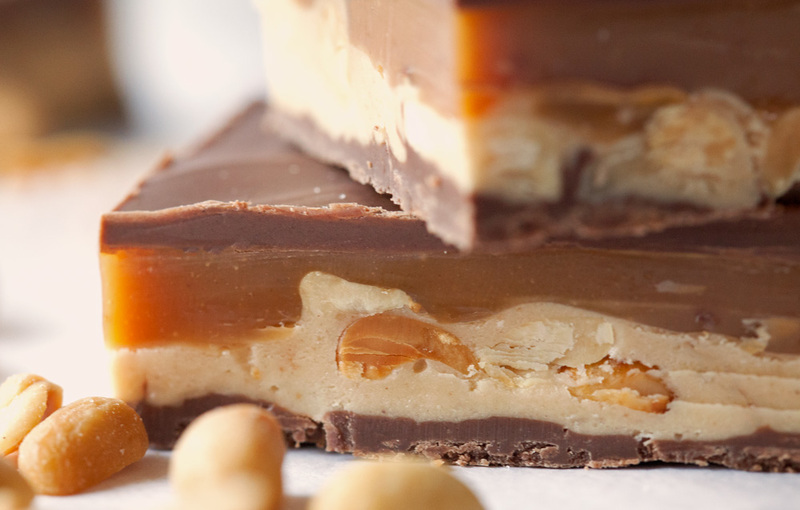 These bars are perfect for holidays or special occasions. Thank you so much for stopping by and saying hi! I am not sure what the English alternative would be since I am not familiar with what’s available. Marshmallow Fluff is a really light and airy cream that tastes like marshmallows and is slightly sticky. Hope that helps. Okay I can’t wait to try this! Let me know how you like them. They are so good! I made these today and they were amazing – virtually nothing left. Mine look just as your photo so I can’t add anything there. However, to Sandra, I bought the marshmallow fluff from Ocado and according to my children, it is widely available in the UK. Do you think these would freeze? Really, I experienced a lack of words to describe these pictures! I just found your page, and still, without ever trying to prepare it, I know it’s delicious. I mean, how can it not be delicious? 😀 this page has a big fan in Brazil from now on!